Judges Refusing to Follow the Law is the Source of Abuse in Conservatorship Proceedings That Feeds Big Bucks to Court Selected Private Attorneys. During recovery from a broken shoulder, Eunice Bellah’s crook CPA sold her home, furnishings and clothing, using a Power of Attorney. He institutionalized her with a diagnosis of delusional beliefs of wealth. Denied a phone, she could not call for help. Slowed by a walker, she could not walk out. Her angry demands to be taken home were silenced with mind altering drugs. 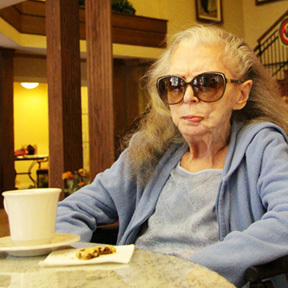 In the conservatorship proceedings that followed, Eunice lost more. Court appointed attorneys, to obtain their appointments as Eunice’s conservators, attacked her friends, defended the CPA, and objected to freezing Eunice’s CPA controlled bank accounts. Two conservatorship judges refused her friends requests to freeze Eunice’s CPA controlled accounts, enabling the crook, an Israeli citizen, to wire $886,000 to Tel Aviv, where he resides beyond our reach. Relying on court filed documents and transcripts of hearings, three times Pulitzer nominated Hollywood Reporter columnist David L. Robb reported the scandal in “Wire the Money and Run. Hollywood Horror Story about how we treat disabled seniors”. Read full article. “I would rather be dead!” Eunice Bellah cried in pain, after surgery Judge Roy Paul ordered at the request of Professional Conservator Francine Teitlebaum. The surgery was contrary to Eunice Bellah’s lifetime health choices, made known to Teitlebaum and the court by her friends of thirty years, one a nurse, neighbor and confidant. More on Roy Paul. The surgery inserted a stent for one of many aneurysms, not even the largest, that Eunice Bellah had for 30 years. “We’re spending a fortune as a country on procedures that people don’t need,” said Dr. Steven Nissen, chief of cardiovascular surgery at the Cleveland Clinic. Unneeded stents are routinely inserted to reap high reimbursement payments from medi-care and private insurance. One heartless greed driven doctor was inserting 30 unneeded stents a day. New York Times 12/5/10. Teitlebaum was advised against the surgery, its painful debilitating effects so horrific, that an honest doctor told her he would refuse it for his own mother. Teitlebaum bills $105 per hour for managing the care of the medical problems the surgery created, from which the good doctor advised 88 year old Eunice could not recover. 2/14/11 Teitlebaum status report and 4/24/12 Teitlebaum status report. Teitlebaum’s approved fees for work through 1/26/12 are $60,113. Her attorney’s approved fees are $83,450. “[W]hile the world is full of dedicated, self-sacraficing caregivers, it also contains far too many people who…stand to gain from continuing life.” Weighing the End of Life, NY Times 2/3/13, by UCSF associate professor of medicine, geriatrician Louise Aronson. Eunice Bellah’s friends were accused by the court appointed attorney of exploiting Eunice Bellah by giving court filings obtainable by the public, to Hollywood Reporter columnist David L. Robb. More on David L. Robb. It is the court appointed attorneys who exploited Eunice by getting their friends appointed her conservators ($105 to $350 per hour), instead of Eunice’s friends (zero per hour). Fees for them as of 1/26/12 are $251,216 by order dated 6/21/12. More on the plundering of assets by court selected professionals. Learn more about Eunice Bellah, Emmy winner and Oscar nominated Art Director Ross Bellah, and their Hollywood family – neighbor and Directors Guild of America Board Member Herb Adelman, and Production Manager Gregory Alpert, who watched over Eunice like a son until prevented by Teitlebaum who stopped visits by all friends. Teitlebaum attacked me with a State Bar complaint that states I violated an 11/29/10 privacy order for causing the 8/18/10 publication of Wire the Money and Run. 1/3/12 State Bar Complaint. I ran in response, removing this web site and its scanned court filings, available to the public, to avoid losing my license. Dismissed “without prejudice,” Teitlebaum is free to make the same disingenuous complaint again. 2/7/12 State Bar dismissal letter. I established Californians for Conservatorship Reform to include others in reasoned fact based debate, based on court filings and hearing transcripts, as to court selected attorneys, the professional conservators they select, and the conservatorship judges we select as voters.